Moves appliances on a cushion of air. REDUCES FLOOR DAMAGE AND BACK INJURY. Moves heavy loads easily, efficiently and safely. System includes two 9-inch x 36-inch aluminum air beams, 12.5 amp, 4 peak horsepower blower, 4 rough surface /carpet adapters and nylon carrying bags. The Airsled system is lightweight and reduces manpower. MOVES APPLIANCES ON A CUSHION OF AIR. Reduces floor damage and back injury. System includes two 9-inch x 36-inch aluminum air beams, 7.5 amp, 1.7 peak horsepower blower, 4 rough surface/carpet adapters and nylon carrying bags. 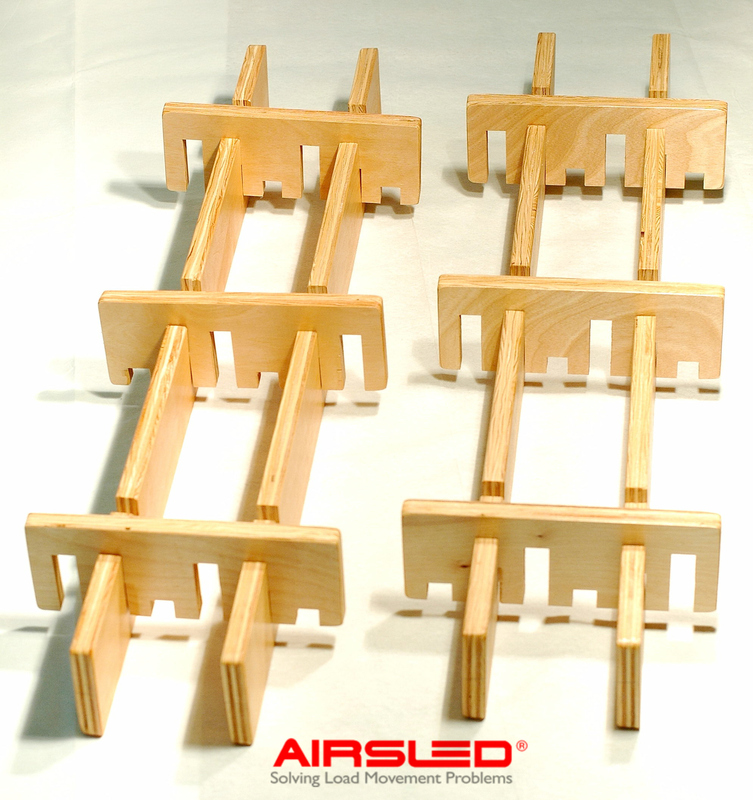 Airsleds are lightweight and easy to use. 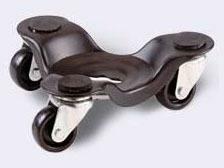 SUPER TRI-DOLLIES Tough polyolefin wheels Wheels swivel easily on steel ball bearings 1 piece per box 9442 12 IN. SUPER TRI-DOLLY SIZE:12" LOAD CAPACITY:300 Lb. Spacer System - patented spacer system for moving loads with legs. Accessory must be used with Airsled moving systems 2004 and 2014. Adjustable spacers easily reduce gaps for appliances on legs and are designed to move loads with legs by bridging the gap between the airbeams and the bottom of the load. The adjustable height is 4-inch to 7-inch. 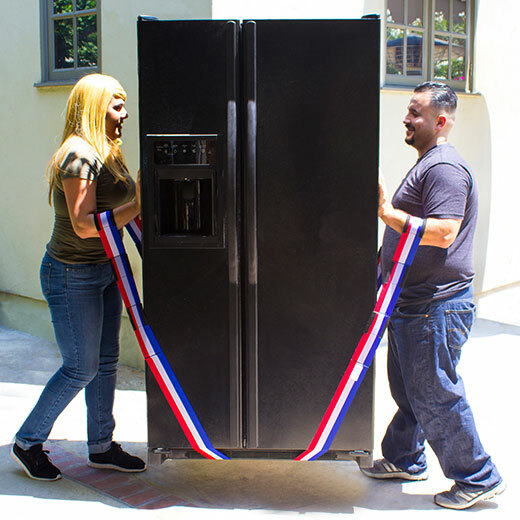 Save your back when moving or handling bulky home appliances and other large items yourself. 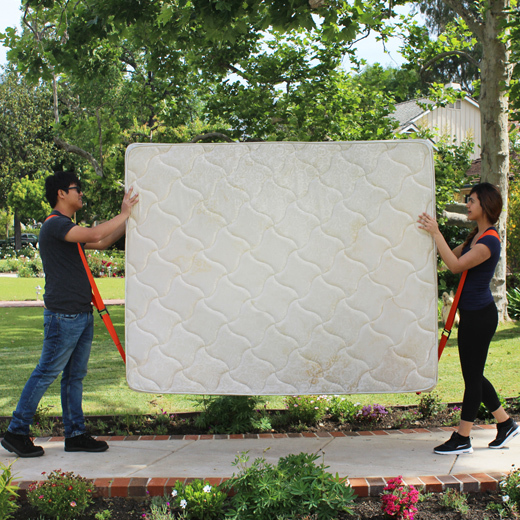 The Buffalo Tools Moving Kit includes a 600 lbs Heavy Duty Truck Dolly and a 1000 lbs Furniture Dolly to help you move big items like sofas, recliners, refrigerators, washers, and dryers from the back of your truck into your home with ease. 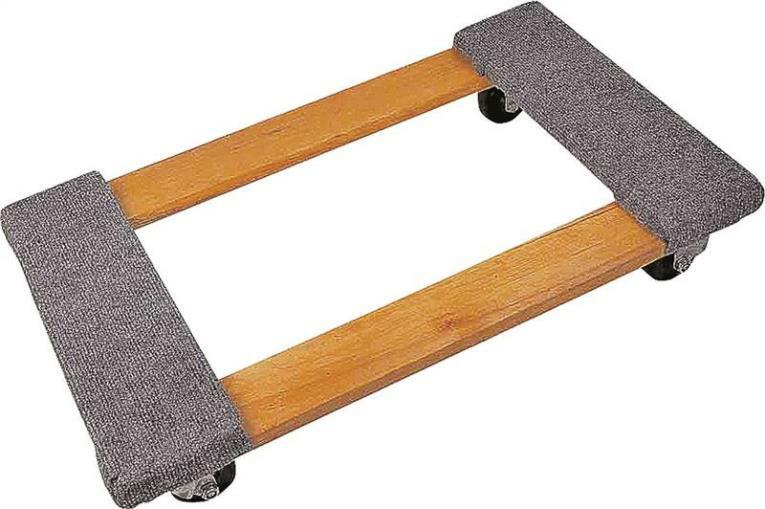 The 30-inch x 18.25-inch dolly has a large and stable wood base with carpeted pads. 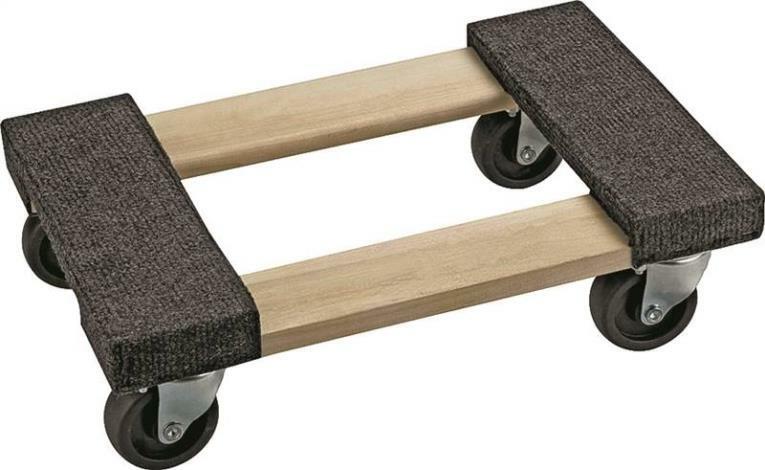 3-inch swivel caster wheels make objects weighing up to 1000 lbs easy to move. The 52-inch dolly is equipped with a large 14 inch long by 8.5-inch wide toe plate, which gives large loads plenty of steel to sit on. 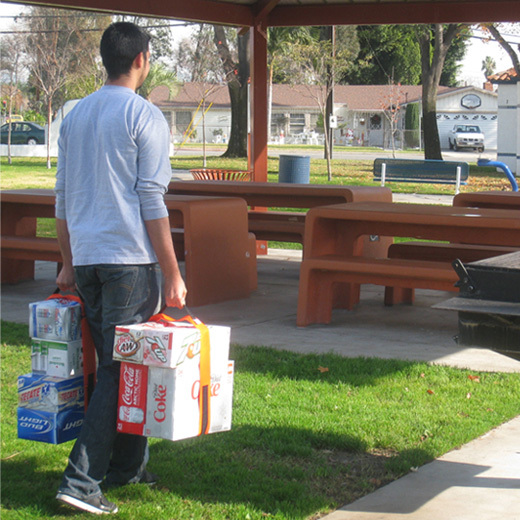 The convenient "P" handle design makes the dolly easy to grip and maneuver. Large 10-inch diameter pneumatic tires have a 3.5-inch wide footprint, giving heavy loads lots of stability and support. 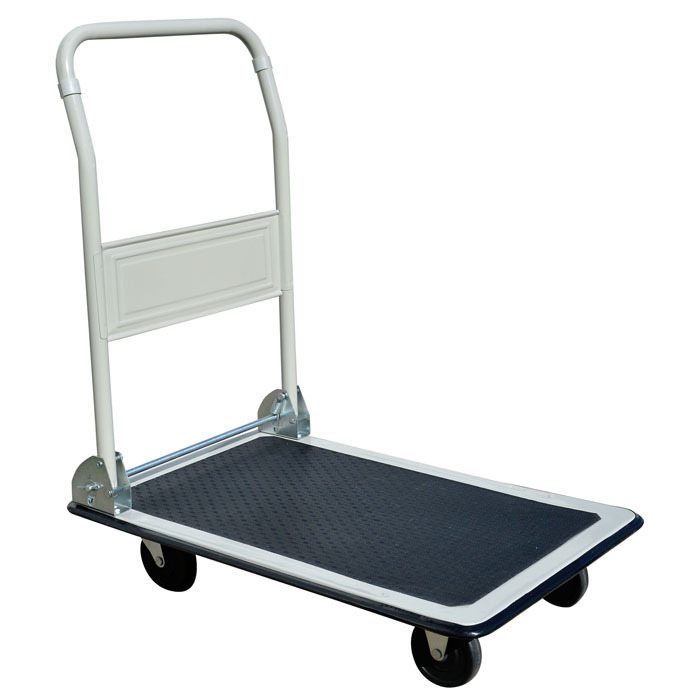 This Heavy Duty Hand Truck has been built to last. The design features a replaceable wheel axle, and a one-inch diameter steel tube welded frame. Keep the handy Pro-Series Folding Platform Truck close at hand to make moving bulky loads easy and safely. 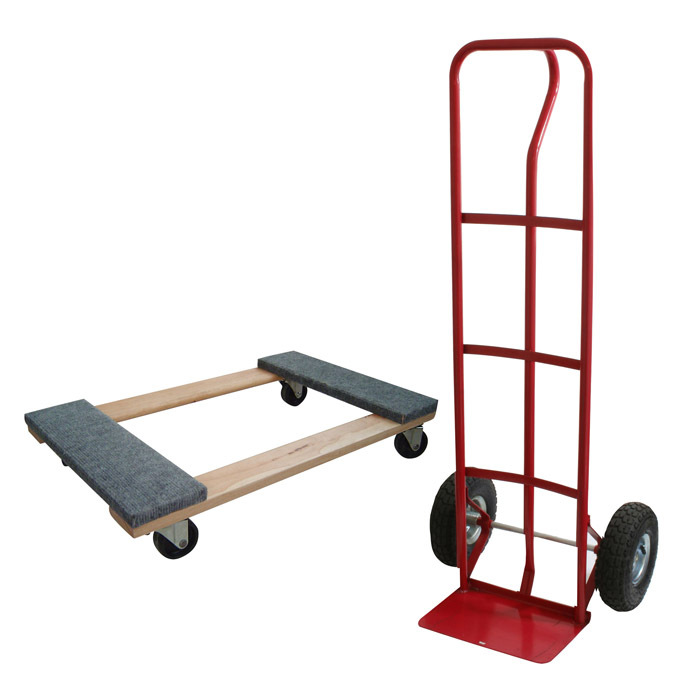 With a 330 lbs load capacity, the Folding Platform Dolly will move paper boxes at the office and bulk groceries from the warehouse club. Keep one in the garage for weekend projects around the house, in the car for hauling large purchases into the house, or at the office to help make stocking supplies easier. Platform Truck nearby to make moving bulky loads easy and safely. WOOD MOVER'S DOLLY Adds mobility to heavy bulk items Load capacity: 840 lb. 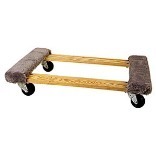 1 piece per box 9850 WOODEN MOVERS DOLLY SIZE:31 x 20"
MOVES VENDING MACHINES ON A CUSHION OF AIR. Reduces floor damage and back injury. Recommended for can vendors. Moves heavy loads easily, efficiently and safely. System includes two 12-inch x 39-inch aluminum air beams, 12.5 amp, 4 peak horsepower blower, 4 rough surface / carpet adapters and nylon carrying bags. The Airsled system is lightweight and easy to use. MOVES HEAVY LOADS ON A CUSHION OF AIR. Reduces floor damage and back injury. Moves heavy loads easily, efficiently and safely. Equipment can be moved in and out of confined areas with exceptional precision. System includes two 9-inch x 48-inch aluminum air beams, 12.5 amp, 4 peak horsepower blower, 4 rough surface /carpet adapters and nylon carrying bags. 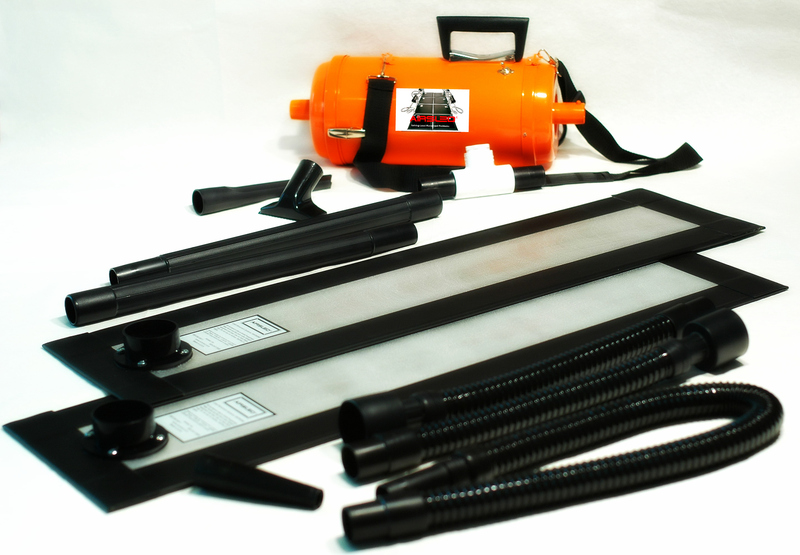 The Airsled system is lightweight and easy to use. Silverbax are a pair of straps that are ergonomically designed to encourage proper lifting techniques and reduce back injuries due to heavy and repetitive lifting. 4 loops on each end vs. Forearm Forklift with 3 loops. 4th loop allows you to carry XS, SM, MED, LG and XL items with ease! These straps employ leverage which makes the items being carried seem MUCH lighter. This makes it much easier to go up and down a flight of stairs and too turn around corners. Silverbax save floors from scratches, dents, scuffs and scrapes that dollies and hand trucks leave behind. They are adjustable up to 64 inches. Rated up to 800 lbs. Buyer beware: Amazon.com sells and delivers fake Forearm Forklift. 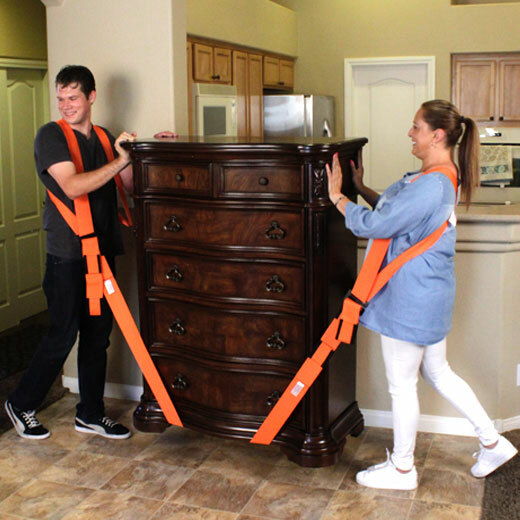 MovXing Cradle - This body harness system ( formerly known as moving harness ) is for lifting and moving items of all sizes. It's especially great for carrying office partitions, desks, lockers, safes, woodworking machines, hot tubs, mattresses, furniture, appliances, HVAC units, cast iron bath tubs, etc. MovXing Cradle encourages proper lifting techniques and employs leverage which makes the items being carried seem MUCH lighter. Saves floors from scratches, dents, scuffs and scrapes that dollies and hand trucks can leave behind. Reduces back injuries due to heavy and repetitive lifting. Buyer beware: Amazon.com sells and delivers fake MovXing Cradle. 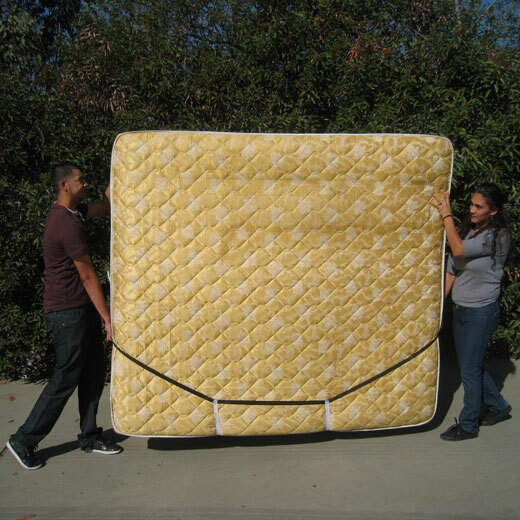 Save your back when moving handling bulky home furnishings, and other large items yourself. The Buffalo Tools 1000 Lb Furniture Dolly will help you get the couch, recliner, and bedroom furniture from the back of your truck into your home with ease. The 30 inch x 18 3/8 inch dolly has a large and stable wood base with carpeted pads. 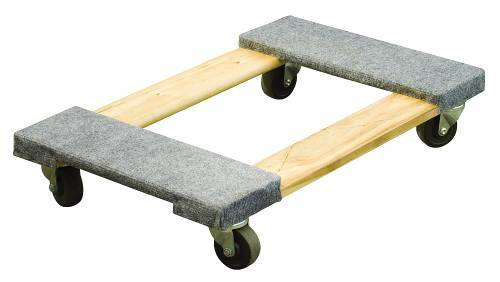 Three inch swivel caster wheels make objects weighing up to 1000 Lb easy to move. Extension Strap is used in conjunction with Forearm Forklift Lifting Straps and Moving Harness. 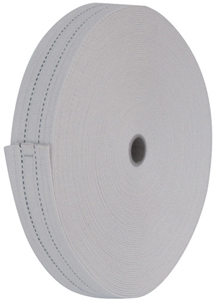 Extension Strap is designed to extend the length of your Forearm Forklifts up to an additional 3 ft. 6 in. ( 106.7 cm ) which allows you to carry XL and XXL items. Easy to set up: Extension Strap has 2 single-looped ends which you simply slide your Forearm Forklifts through to lengthen your Forearm Forklifts. Buyer beware: Amazon.com sells and delivers fake Forearm Forklift. Forearm Forklift in the color pink with the breast cancer awareness logo because our company has donated $10,000/year more than a couple times to support research for a cure. These sell very well at retail during October because Oct is breast cancer awareness month. They're the same design as the orange Forearm Forklift. Buyer beware: Amazon.com sells and delivers fake Forearm Forklift. Forearm Forklift are a pair of straps ergonomically designed to encourage proper lifting techniques and too reduce back injuries due to heavy and repetitive lifting. These straps employ leverage which makes the items being carried seem MUCH lighter. This makes it much easier to go up and down a flight of stairs and too turn around corners. Forearm Forklift save floors from scratches, dents, scuffs and scrapes that dollies and hand trucks leave behind. They are adjustable up to 48 inches so you can easily carry SM, MED, LG and XL items. Rated up to 800 lbs. Buyer beware: Amazon.com sells and delivers fake Forearm Forklift. 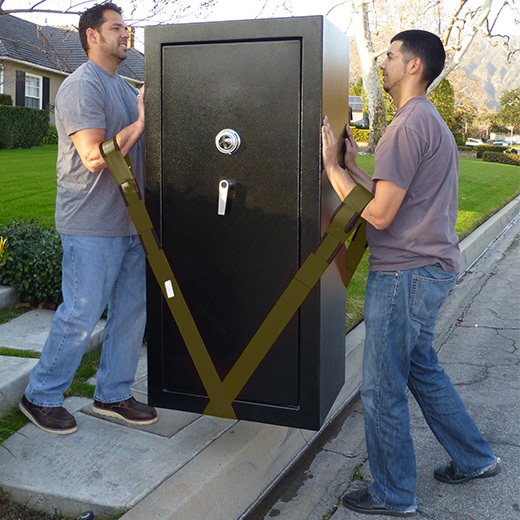 Sash-N-Go is designed to effectively carry heavy furnishings without straining your back. Rated for up to 800 lbs. Sash-N-Go goes over a single shoulder vs. MovXing Cradle which goes over both shoulders. Contents include 2 sashes and 1 center strap (c.a.s.). The c.a.s. is 8' 8" long and is completely adjustable up to 64". Buyer beware: Amazon.com sells and delivers fake Forearm Forklift. Forearm Forklift - Special Edition are a pair of straps that are ergonomically designed to encourage proper lifting techniques and reduce back injuries due to heavy and repetitive lifting. These straps employ leverage which makes the items being carried seem MUCH lighter. This makes it much easier to go up and down a flight of stairs and too turn around corners. Forearm Forklift save floors from scratches, dents, scuffs and scrapes that dollies and hand trucks leave behind. They are adjustable up to 48 inches so you can easily carry SM, MED, LG and XL items. Rated up to 800 lbs. Buyer beware: Amazon.com sells and delivers fake Forearm Forklift. We created these straps for painters. This adjustable painter's prep tool is for moving furniture and appliances of different shapes and sizes, before and after painting a room and / or area. Rated for items weighing up to 800 lbs. These straps avoid leaving scuffed and / or scraped floors. Buyer beware: Amazon.com sells and delivers fake Forearm Forklift. This strap conveniently allows different sized boxes and other items weighing up to 40 lbs. ( 18 kg ) to be carried together efficiently. 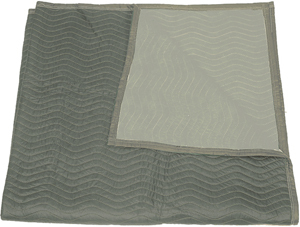 It is designed to carry smaller, heavier items such as: mail packages, beach gear, folded up chairs, firewood, etc. Box Strap can quickly be adjusted for different sized items. It is also the widest around, making it the most stable and efficient. Buyer beware: Amazon.com sells and delivers fake Forearm Forklift. MovXing Cradle - Go USA - Special Edition is a body harness system ( formerly known as moving harness ) for lifting and moving items of all sizes. 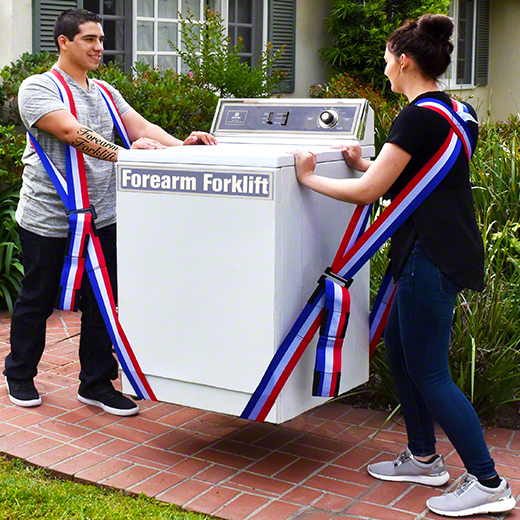 It's especially great for carrying office partitions, desks, lockers, safes, woodworking machines, hot tubs, mattresses, furniture, appliances, HVAC units, cast iron bath tubs, etc. MovXing Cradle - Go USA - Special Edition encourages proper lifting techniques and employs leverage which makes the items being carried seem MUCH lighter. Saves floors from scratches, dents, scuffs and scrapes that dollies and hand trucks can leave behind. Reduces back injuries due to heavy and repetitive lifting. Buyer beware: Amazon.com sells and delivers fake MovXing Cradle. Forearm Forklift - Ultramarine Blue - Special Edition are a pair of straps that are ergonomically designed to encourage proper lifting techniques and reduce back injuries due to heavy and repetitive lifting. These straps employ leverage which makes the items being carried seem MUCH lighter. This makes it much easier to go up and down a flight of stairs and too turn around corners. Forearm Forklift save floors from scratches, dents, scuffs and scrapes that dollies and hand trucks leave behind. They are adjustable up to 48 inches so you can easily carry SM, MED, LG and XL items. Rated up to 800 lbs. Buyer beware: Amazon.com sells and delivers fake Forearm Forklift. 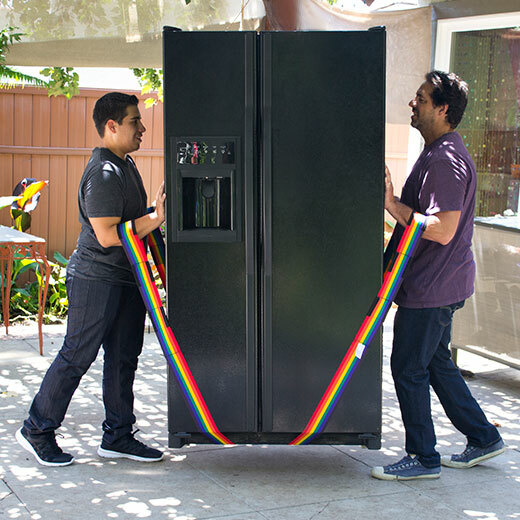 Forearm Forklift - Rainbow Edition are a pair of straps ergonomically designed to encourage proper lifting techniques and too reduce back injuries due to heavy and repetitive lifting. These straps employ leverage which makes the items being carried seem MUCH lighter. This makes it much easier to go up and down a flight of stairs and too turn around corners. Forearm Forklift save floors from scratches, dents, scuffs and scrapes that dollies and hand trucks leave behind. They are adjustable up to 48 inches so you can easily carry SM, MED, LG and XL items. Rated up to 800 lbs. Buyer beware: Amazon.com sells and delivers fake Forearm Forklift. Forearm Forklift - Camo Green - Special Edition are a pair of straps that are ergonomically designed to encourage proper lifting techniques and reduce back injuries due to heavy and repetitive lifting. These straps employ leverage which makes the items being carried seem MUCH lighter. This makes it much easier to go up and down a flight of stairs and too turn around corners. Forearm Forklift save floors from scratches, dents, scuffs and scrapes that dollies and hand trucks leave behind. They are adjustable up to 48 inches so you can easily carry SM, MED, LG and XL items. Rated up to 800 lbs. Buyer beware: Amazon.com sells and delivers fake Forearm Forklift.